My name is Rhema and I am autistic. I was trapped in silence for twelve years. My autistic body would not obey my intelligent mind. To be totally stuck in your own head is a nightmare. Sometimes I hurt myself and did destructive things because I was so absolutely frustrated. The one hope I had was one day that I would have a voice bigger than I could imagine. My mother took me to learn RPM and this was the moment I was sure I would be able to speak one day. It took a lot of work but I learned to make my finger point on my letterboard and keyboard and I learned to also listen to the letters in my head. Now I am able to share my thoughts. Now I am able to study strong subjects in school. Now I have two friends that I can talk to. Now I have education opportunities I never had before. Imagine how disheartening it is to hear that your organization would say that my means of communication is not valid and is even harmful. How can you say that I am not the author of my own thoughts just because I need support? How can you say that the thing that has freed me from a prison of silence is a hoax? I hope you will reconsider your position. I hope you will not jeopardize the chances of others to have their voices heard. I hope you will listen. The proposed policy on the American Speech-Language-Hearing Association (ASHA) can be read here. When Hope was 3 or 4 years old she wanted to know what in the world I did with myself when she wasn’t around. Especially after she went to bed. I told her I go flying at night for exercise. It occurred to me at this point that I might be getting carried away with my little story. I felt a tad guilty because I didn’t expect her to just believe me so easily. There was no turning back now. I burst into an exaggerated rendition of “The Wind Beneath My Wings” and whooshed through the living room. Fly. Flyyyy. Flyyyyyy away. You let me fly so high. We researched and discovered there is a species of hummingbird whose feathers refract a gorgeous, vivid hot pink. Hope was delighted. She talked for hours about how she’d flap her wings so fast they’d hum like Rhema, how her pink head would glow in the dark. This was not an easy year for my Hope. She experienced deep, unexpected losses – that of her beloved grandpa and a dear friend. She tasted bitter disappointments repeatedly and had to adjust to changes. For the first time as her mother I could not shield her with my wings. I could not do or say something to make it ok.
A couple times I wondered if she would lose heart. But no. She knows the true Source of Hope. This Hope does not disappoint. This Hope is not just a wish or fancy, but an abiding, unshakeable expectation. She has this Hope as an anchor for the soul, firm and secure. And her forerunner, her Audience of One, is Jesus. And so. Without much recognition, she persists with a quiet excellence at everything she does. She faithfully loves God and family and those around her with gentleness and kindness. We could not be prouder of who she is. On her last day of 5th grade, we took a “Hope and Mommy Day” (a long tradition of ours), just the two of us. And for a sweet little while we were hummingbirds and crows, flying. We love you bigger than the sky, dear Hope. Today Rhema teamed up with her friend Miss Jess to share a presentation with a wonderful team of specialists at Boston Ability Center. Rhema agreed to share part of her presentation here. To help Rhema prepare, Jess provided the questions. Question: How do we walk the fine line between choosing activities/designing therapy for our patients (autistic individuals) that is functional for classrooms, social scenarios, the work place, etc. while also incorporating the idea that we don’t want to “force” our clients to act as neurotypical individuals. What kind of therapy would you like to get if you were getting services at BAC? Rhema: I think the best therapy is the kind that helps students really improve their ability to communicate . I mean hellp them learn to listen to their mind. The autistic body has trouble listening to its mind . The therapist that only treat me like a baby will only expect me to climb a tiny tree when i really can scale a mountain . Therapy that is most helpful is therapy that helps me challenge myself to control my impulses in a way that is not demeaning . For example i love to steal markers. The way to demean me is to speak to me as if i am a baby. You should try to remember that i am a teenager with an autistic body that makes its own destruction sometimes. Every one should only make time to understand the person they are working to support. Can you make good ideas about someone’s needs if you don’t really know their abilities ? I knew how to read at age five but some therapists only wanted me to identify letters repeat repeat repeat . I wake up every day really happy because i can have strong subjects to study. The best therapy in education is the kind that helps students learn challenging material. Too much time is wasted on too many preschool things . I would like to have more hellp with my handwriting and typing and speech in a way that is not going to belittle me. I think you do this by incorporating interesting lessons not simple stories . Question: How does a therapist know they can / should move on from an activity (ie pointing to letters or repeating their sounds) when the client hasn’t been able to perform it successfully? This is a really tough thing both for parents and therapists to figure out… we want to presume competence but without evidence of understanding, there’s the fear that we’re moving too fast, not doing our jobs in really teaching our students but rather moving to the next thing before they’re ready, which can be frustrating for the student. How do you recommend handling that conundrum? Rhema: The best thing a therapist can do when they don’t know whether a student can do the work is to assume they can. The student will be more frustrated if they are given simple work over and over than if they are given something more challenging. I know this from my own experience. I was so frustrated that i could not really do well. Then i got my chance to study challenging subjects. I was so afraid that my teacher would give up and keep giving me simple lessons. She did not make her lessons simple even when i got answers wrong even when i crawled under the table. That gave me hope even though i was so afraid that i would fail. Question: How can therapists help work with kids like you on impulse control, coordination etc.? What are some therapy activities that didn’t work or that you disliked? What activities have been most helpful/useful? Rhema: Can you stop forgetting that i am going to have my mind tell me one thing and my body do another? I will often only do the things that are easy like type gibberish because it is too hard to make my finger listen to the letters in my head. I need therapies that help me win the fight against my uncooperative body. I don’t understand my therapists who ignore the fact that i am smart and still make me do tasks like identifying happy and sad faces. The therapies that i think might help are ones that work on my ability to notice what is important and filter out everything else. I get so loud in my head that it is impossible to notice only what is important at that second. To always have so much information is so hard. I see too much like the granularity in a letter on a page. I hear too much like the pine needles falling outside. I feel too much like the happiness of my friend Reilly in the seat beside me. It is a blessing and a curse. Only a few people have really found a way to help me focus on the letters in my head. Soma Erika my mom and Hope. I hope i can get better and better. Question: How do you include people who type or point? Rhema: You treat them just like you would treat any student. Give them an opportunity to learn and share their thoughts. My school was the first place where teachers and classmates that treated me like I was a normal student. I just communicate on my iPad. Even when I am not able to type well they never assume that I just don’t understand. Time will tell how much their support means to me. In 2017, Rhema moved from the letterboard to the keyboard. to you i am a girl who found her voice but i am a bird who has taken to the sky . i am a hyena who laughs at the world . i am a frog who jumps for joy . i am an aard vark who . play s all day . with worms . i am a lion who rulles the day. i am a giraffe standing talle r than ever . Something I want to say is nothing to say is ok. So many people think that they need to speak but sometimes silence is golden. I was silent for twelve years and I learned so much by listening. To have no voice taught me to cherish words and I try to use them carefully. That is all I have to say today. something i want to say is just because i cannot speak does not mean i dont hear . i hear everything people say to me or about me . i may not show understanding in my face but i know and understand . not a word said escapes my so strong ears . so remember to speak kindly to everyone . love rhema . Something I want to say is not having a voice sounds horrible but I learned to listen. That is how I learned so much. By listening to everything around me. The radio the tv, conversations all around. Only I knew that I understood it and one day I would be able to show it. I am thankful for that time as hard as it was. or if I was hurting. They often treated me like I was a baby. This was so frustrating to me but I hoped one day they would know the real me. Someone once said I was stupid because I could not talk. This hurt so much. Only now can I look back and see that it made me stronger. Now I have my voice and lots of people read my words. This makes me so happy. I want teachers to know that I am smart even though I might be slow on my board. Sometimes I can’t seem to make my mind slow down but I am always thinking. I want teachers to give students like me a chance to really get a quality education. Someone said to get a high school diploma you need to have taken certain classes. I have not. But I hope that will change so I can become a scientist and use my mind to help others. I think I have a lot to offer to the world. This is my hope. I am so happy for my birthday. To be a teenager is a dream come true. I am excited for the future and I know God will help me suceed. I am confident that He has good plans for my life. something i want to say is that autism acceptance starts with people believing that everyone deserves a chance to access a fair education. i hope to help other autistic people like me become advocates because this is the only way to make our voices heard. i hope people will listen to our words because we have a lot to say to the world about what it means to be autistic. many people think they knowbut they do not. autism is a complicated disorder. not everyone is impacted as much as me. but i am smart and i hear music in numbers and trees and grass. i am happy to be autistic even though its hard most of the time. so much of my words come from God. he is helping me live this life. to have my voice heard means the world to me. to have people encourage me also means the world. to have a company of encouragers is the best gift. thank you for listening to me. i hope to be a scientist one day. i hope to go to high school and college one day too. so many possibilities are open to me now that i have my voice. not being able to go to whatever school i want makes me so sad. i should have access to the same education as anyone else. i know i need lots of support but i believe it is worth it. someone once said the best students are the ones who really want to be there. that’s me. so i will never stop trying to get the best education i can. i owe it to me and my family and other autistic people who have yet to find their voices. i want you to know that i am autistic and that is something i am happy and sad about. i love that God made me this way even though it is so hard sometime. i can hear music in trees and grass and numbers have sounds that make me so happy. i also can remem ber just about every thing i hear . the reason i said it makes me sad is because i cant talk with my mouth and that is so hard to not have the ability to just speak whenever. i know it seems like i am not smart but i am . i believe one day i will show the world that autistic people are smart and want the same things as anyone else. thank you for being patient with me while i learn to sit in class. i want to have an education that helps me reach my goals. thank you for listening. some thing i want to say is not so many people think about autism like a gift. but i do. i experience so many thing s like colors and sound s and emotions and dimensions of time i n a way that only i can. this make s me so happy . i see details i n flimsy grass blades and green caterpill ars . i can rem ember almost every sound my ears hear. it is store d in my helper head. i can think about my autism as a gift and that hellps me on days that are hard. the bible say s that to be content is a secret and i think i am learning contentment in my aut ism. i feel to awesome for words be cause its the day god has made . i cant for get his love for me . do you know so mu ch love i n any o the r. i do nt eith er. so mething i want to say is my grand pa died this week. he resides in heaven now . i came to his house and looked for him but he is not here . he is with his savior and he is so happy . i miss him so much even though i dont cry . he always told me he loved me and was proud of me . have you ever jumped on a trampoline my grandpa gave me mine . he read his bible every morning . he will always be in my heart . love rhema . when i was little my grandpa took me for a ride in the 4-wheeler . hope was with us . she was counting deer . then grandpa said theres dinner for all of us . i thought it was so funny and i still remember it . that was grandpa . i must create some thing good for my life . that is really what grandpa would want . i pray for god to hellp me . to do it . every day . i am thankful for my autism because it teaches me to trust God . My body is not something i can trust but the God who made me is . he not only made me autistic he made me not able to speak with my mouth but with my heart . The gift of my voice is my sweetest song of praise. i want to sing and sing . i not only want to sing i want to share my song with the world . my hope is in the lord . i thank him . for he is always good . to be autistic is to be a gorilla in a tutu. your clothes never fit quite right . to be autistic is to be a dinosaur making large footprints on the earth . your body is not for this age . to be autistic is to be an eagle with too strong eyes . your eyes see the miniscule details others miss. to be autistic is to be a hippo with birds on your back. you still feel the itch. to be autistic is to be a lizard who basks in the sun. you feel the heat and it invigorates you and drains you. to be autistic is to be a telescope seeing the world with microscopic detail . to be autistic is to be a megaphone every thing is too loud . to be autistic is to be a butterfly ready to fly . Years ago, I began reading The Reason I Jump by Naoki Higashida. Naoki is a non-speaking autistic young man who communicates through the use of an alphabet grid and computer. I was eager to read his thoughts, hoping to unearth insights into my own daughter, hoping to find a reason to believe that she too had words inside waiting to be unlocked. But as I read, I discovered that Naoki did have some spoken language. It was largely echolalic language, but that fact alone caused me to put Naoki in a different category, a “higher” category than my girl. Rhema had no spoken language – the few words she was able to say when prompted had essentially faded away. I reasoned she could not achieve the level of communication Naoki had. Deflated, I put the book away. I didn’t realize my error: mistaking communicative non-functionality for mental non-functionality. Thankfully, thankfully, my misconceptions began to change in 2015 when an RPM (Rapid Prompting Method) provider taught my daughter an age-appropriate lesson on the Ice Age, and I watched her respond appropriately and accurately to questions about the lesson. Later I would discover that my 11-year-old (at the time) whom I thought did not know the alphabet letters had taught herself to read at age 5. Much of her schooling and therapies seemed to be structured around the concept that Rhema’s severe autism represented developmental, cognitive delays. I never questioned the experts who said we should speak to her in simplified one and two-word phrases: “Give ball”, “Shirt on”, “All done”. Rhema words, along with other autistic non-speakers or minimal-speakers – Ido, Emma, Phillip, Coco, Graciela, Kaylie, Josiah, Diego – opened my eyes and continue to teach me. I listen to them now, their voices the loudest. As parents and educators, what will happen if we begin to re-think long-held assumptions about autism? If we resist comparing individuals to non-autistic or even autistic peers (like I did with Naoki) and see their development as their own? If we stop pretending to presume competence and truly do it? What if we assume that behind the silence and the erratic impulses and the lack of eye contact and seeming lack of attention, there is a mind as creative, inquisitive, insightful as our own… what if we adjust the curricula accordingly? No harm done if we do. But what if we don’t? This year Rhema is homeschooled for language arts and history and enrolled in middle school math and science classes. She is studying everything from geometry to Newton’s Laws of Motion. It’s been a long, hard road. It’s still hard every day. Her anxious body betrays her constantly. She needs many, many breaks. It can take an hour to type a single paragraph. Some days her body is so disorganized, she cannot type at all, so she spends hours trying to get ahead on the homework. She is thrilled to have homework. Her teachers have written that Rhema’s test scores have been regularly strong and she demonstrates good mastery of the topics covered. In fact, she received all A’s on her report card. She is sharing letters with friends, speaking to college classes, contributing to a book, and participating in the TASH Atlanta conference next week. She sits in the back seat of the car with her sister and the letterboard and entertains us with stories and rhymes. She’s an incredible storyteller. It’s a suffocating, terrifying thought to realize that I might never have heard her stories. All she needed was a chance. She needed teachers and a learning community that dared to see beyond the challenging “behaviors” and find her strengths, to include and welcome her (– keyboard, letterboard, crazy-Mom-aide and all), to value her as any other student. It’s so important. It’s life-altering. It’s hope, new hope, for our Rhema. i am so happy about my grades . i remember when i thought i would never be able to make my thoughts heard . now i am going to school and finding the world and my dreams . only god knows how much i have longed for this. you are not underestimated all your life only to be given a chance to exercise your in telligent mind. but it has happened to me . my good god made a way. my good teachers dont treat me like a baby . my really good mother never gives up. my really good father never stops supporting me. my really good hope always encourages me to do my best . like the way my teachers said i am a blessing to have in class. the end. love rhema . Snippet from Rhema’s recent report card. Rhema and her precious friend Syd often have play dates on Sundays. 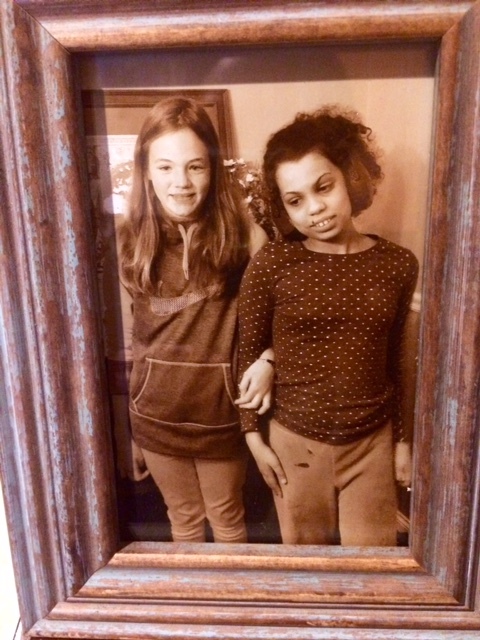 When I ask Rhema what she wants to do with her friend, her answer is almost always “talk.” She treasures it, after all the years of silence, the gift of conversation. And she genuinely enjoys getting to know her friend better. i want to talk with syd about girl stuff. And with those simple words I remembered once again that my soon to be thirteen-year-old girl is my soon to be thirteen-year-old girl. Her days don’t look very much like those of other girls her age, but she shares many of the same interests, hopes and dreams. Syd was totally up for talking about girl stuff. She sat at the table and did some coloring before Rhema broke off all the tips of a new set of markers. I held Rhema’s iPad and she slowly typed, “hi syd”. What happened next was one of the most vulnerable, beautiful conversations I have ever heard. I learned new things about my daughter that only make me love and respect her more. And Syd is a rare gem. She is genuine, patient and kind. She never seems put off by Rhema’s challenges, differences or seemingly odd behavior at times. She sees past all that and, as Rhema says, sees her. Syd dares to find ways to connect, and she sincerely enjoys their time together. The conversation below may read fast, but it took an hour. Rhema is very slow at typing and it takes so much concentration and focus to complete a sentence. In between typing/pointing she nervously slapped her leg or licked her fingers or ripped paper. But she persevered. Because she loves, loves talking with her friend. Syd: Go to church, go to youth group, spend time with you, relax, sing and bake. What is your favorite thing to do on weekends? Rhema: What do you like most about me? Syd: You’re kind and sweet and welcoming. And a very good friend. Syd: That’s cool. My parents just liked my name. Do you have a favorite movie? Rhema: How do you feel about boys? Syd: Sometimes they can be really annoying. Sometimes they can be really nice. How do you feel about boys? Rhema: I think they are cute and I hope to get a boyfriend one day. Rhema: Someone once said I was too loud in church. Do you think so? Am I too loud? Syd: No. Not at all. Syd: My mom’s cousin has cancer. And I hope that the snowstorm will not be too dangerous. And I hope our friendship goes on forever. How can I pray for you? Rhema: I want to go to more school where I can be challenged and have friends. Rhema: Thank you for talking to me today. I love you.